PTS recently welcomed the Mayor of Kakogawa City, Japan. Auckland was their sister city during the Waitakere Council days. 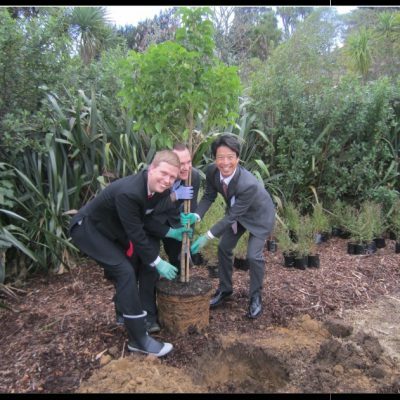 He visited a PTS site managed by Community Waitakere who facilitated a native planting. The group included the Kakogawa Mayor and his delegation, Henderson-Massey Local Board, Council’s Community Parks and Places Manager and other representative groups from the public and those involved with Waitakere Council. 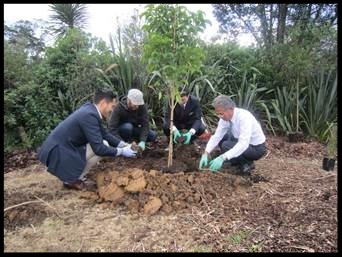 The ten large specimen trees that were planted (including puriri and kowhai) will contribute to PTS plant species diversity and the Mayor, Phil Goff’s Million Trees Initiative.